We’d love your help. Let us know what’s wrong with this preview of Rain by Cynthia Barnett. Cynthia Barnett's Rain begins four billion years ago with the torrents that filled the oceans, and builds to the storms of climate change. It weaves to Rain is elemental, mysterious, precious, destructive. How can rain be both sad and comforting? Could it be in the same way that sad songs are cathartic? Zoe's Human I would say your analogy is apt. It is as though the world weeps with you in your grief. There is comfort to be found in that. EDIT 28/12: HFK's Best Nature Read in 2016. Like most humans, I too have a conflicted relationship with rain. Most of the time I quite enjoy it, but occasionally I wish it would just stop messing up my plans. That is the case more often than it is a case of me wishing rain to come and cool the air, make the ground wet and flourishing. That is one of the privileges of living in an area that gets just enough dry times as it does get enough wet times, too. We all know the importance of water to our e EDIT 28/12: HFK's Best Nature Read in 2016. We all know the importance of water to our existence, we all know that the source of our water is the beautiful and natural act of rain. We know the devastating outcomes of storms and floods, we do know that despite of the dramatic effects of too much rain, it is always better than the dry times experienced around the world. The real, silent killers. If there is a right person to write a natural and cultural history of rain, it has to be Cynthia Barnett. An environmentalist, an activist, a professional who has the great knowledge and passion to tell the world the comprehensive, meaningful story of The Rain that expands the appreciation of this natural phenomena in ways that are more than admirable. Rain dives into the scientific side of rain, explaining entertaining ways what is the deal behind this process, and what are its positive and negative affects to our nature. The ways rain has shaped animals, our surroundings and the everything green. Where is the rainiest areas in the world, where is the silent refugee which makes it possible to fully appreciate the sounds of raindrops. And how about weather forecast, how did they came to be, and why it is still important to have thousands of volunteers to collect the data of what happens with the weather around the globe. But Rain is much more than just a scientific approach to the subject, it is a love song of cultural history of the rain. We worship it, we pray for it, we talk about it constantly, our literature and movies are full of it. Rain has been constantly present, in the shadows of our daily life, always there, always documented, changing its own shapes through the multiple different cultures and countries. Even though Rain being an nonfiction book, it was so easy to feel Barnett's love and devotion through her chosen words. An encyclopedia that surfs through the history in such a intensive enthusiasm that it is almost impossible not to get yourself excited to the moon and back. And it makes it impossible to ignore the climatic change (for some reason, it seems to happen quite a lot) our earth balloon is facing right in this very moment. Audio narration did every bit of justice to the words, and no doubt really pumped up the experience and the feels. I had a professor in grad school who once asked, "Why are there so few good books on the weather?" Finally, here's a good book on the weather - all about rain, just enough, too much, too little, and how rain affects human civilization, culture, and survival. The writing is crisp and engaging. The stories are compelling and interesting. Many of the historic effects of rain or lack thereof are presented through the experiences of real people and events. You will learn about the initial disdain of th I had a professor in grad school who once asked, "Why are there so few good books on the weather?" Finally, here's a good book on the weather - all about rain, just enough, too much, too little, and how rain affects human civilization, culture, and survival. Many of the historic effects of rain or lack thereof are presented through the experiences of real people and events. You will learn about the initial disdain of the English for the umbrella and then their love affair with them, why you hardly ever see traditional bamboo and paper umbrellas in Japan any more, efforts to produce wearable truly waterproof clothing, westward expansion across the American Great Plains during a time of moisture and misplaced faith in the fact that the human activity of breaking sod brings rain only to be dashed by the Dust Bowl, and on and on and on. I was particularly interested in the episodes where human understanding of rain shifted from mystical water diviners to charlatans who readily took people's money to produce rain (or not) and the negative impact of these people on developing atmospheric science. In this book you will also read about the impact of climate and weather on contributions to human culture, music, literature, art, e.g., why "The Smiths" music feels the way it does. This is really cool stuff! Finally, a really good book about the weather with something for pretty much everyone. Rain: A Natural History weaves together planetary science, geology, early earth history, meteorology, human history, cultural studies, travel stories, and even poetry into an entertaining and fascinating account of rain and our relationship to it. The book is beautifully written--vivid, sometimes humorous, and almost poetic without being flowery. It’s easy to fall under its spell. I especially enjoyed all the history and the sections on how depictions or evocations of rain have enhanced various Rain: A Natural History weaves together planetary science, geology, early earth history, meteorology, human history, cultural studies, travel stories, and even poetry into an entertaining and fascinating account of rain and our relationship to it. The book is beautifully written--vivid, sometimes humorous, and almost poetic without being flowery. It’s easy to fall under its spell. I especially enjoyed all the history and the sections on how depictions or evocations of rain have enhanced various works of literature, music, painting, and movies. I received a complimentary copy of this book from the publisher through LibraryThing. Review opinions are mine. I am the target audience for this book. I've sat in the rain at Arthur Ashe stadium for two days in a row, and I did this for two U.S. Open tournaments. I am a gardener who doesn't use chemical fertilizers, herbicides, or even the garden hose. I am a baker who knows that meringues are puffier on dry days. I have curly hair that blossoms into a cloud at the first hint of mist, and there still isn't a rainy day that I don't raise my face to the sky to catch the drops. And yet . . . and yet . . . th I am the target audience for this book. I've sat in the rain at Arthur Ashe stadium for two days in a row, and I did this for two U.S. Open tournaments. I am a gardener who doesn't use chemical fertilizers, herbicides, or even the garden hose. I am a baker who knows that meringues are puffier on dry days. I have curly hair that blossoms into a cloud at the first hint of mist, and there still isn't a rainy day that I don't raise my face to the sky to catch the drops. And yet . . . and yet . . . this book bored me. It's a potpourri of rain facts. Barnett begins with the formation of the Earth, which was interesting. Then she briefly touches on different cultures' associations on rain -- about a paragraph for each culture's story about the rain. Then there's a long chapter that's really product placement for Mackintosh raincoats. Then there's a chapter on rain in literature that's filled with conclusory statements. (What, exactly, were Emily Dickinson's "best" poems? Who chose them?) There's just too much going on, and this half read like a stream of consciousness. This could be a dry subject (ha ha!) but Barnett's wide scope and engaging storytelling bring the wonder, mystery, and profound importance of of this seemingly ordinary phenomenon to life. Considering rain from the perspective of history, science, music, literature, politics, etc., Barnett explores her subject through the stories of a farmer on the Great Plains, TV weathermen, raincoat makers, an anthropologist exploring ancient Mesopotamia, a king convinced that witches are thwarting his effort This could be a dry subject (ha ha!) but Barnett's wide scope and engaging storytelling bring the wonder, mystery, and profound importance of of this seemingly ordinary phenomenon to life. Considering rain from the perspective of history, science, music, literature, politics, etc., Barnett explores her subject through the stories of a farmer on the Great Plains, TV weathermen, raincoat makers, an anthropologist exploring ancient Mesopotamia, a king convinced that witches are thwarting his efforts to bring his bride across a stormy sea, a patent lawyer heading a project to blast rain out of the sky with siege guns left over from the Civil War, a shyster traveling the country with a mysterious chemical brew “guaranteed” to draw rain, a whole series of writers who are inspired by and who use rain in their works, movie makers, Indian fragrance manufacturers using techniques thousands of years old to capture the scent of rain, an ichthyologist at the American Museum of Natural History collecting stories of fish and frog rains, engineers struggling to restore the South Florida water system, climate scientists creating models to predict and plan for extreme weather events, a visit to a village in India which may be losing its claim to be the “wettest place on earth,” and many, many more. The variety of angles on rain maintains the subject's appeal, and Barnett avoids bogging down in scientific complexities (her two earlier, award winning books, Blue Revolution: Unmaking America's Water Crisis and Mirage: Florida and the Vanishing Water of the Eastern U.S., are on water systems issues – she definitely knows her stuff) but clearly conveys the essence of the problems she is describing. Her sentences occasionally become a bit circuitous, but for the most part her writing is clear and lively. I enjoyed this very much – as a displaced and homesick Floridian I found the sections on my home state particularly interesting – and give it 4 1/2 stars, rounding up to 5. I received an advance copy of this book from the publisher, and I must admit I was a little wary at first--how interesting can you make rain? Very interesting, it turns out. First of all, the book is beautifully written. It is lyrical without being silly or overwrought, and the huge range of topics covered flow easily and smoothly from one to the next without feeling rushed or rambling. As for the substance of the book, I feel that Barnett has written rain's definitive biography. She explores how I received an advance copy of this book from the publisher, and I must admit I was a little wary at first--how interesting can you make rain? As for the substance of the book, I feel that Barnett has written rain's definitive biography. She explores how rain has shaped religion, culture, fashion, law, art, music, and anything else you could think of. It would be easy for this book to be boring, but there is always something new around the corner and the people are fascinating and sometimes funny. Her treatment of climate change is brilliantly done as well--not too heavy-handed and undeniably convincing. I couldn't stop reading parts of it out loud to whoever happened to be around at the time. I was gifted this book through the first reads program at Goodreads. I love the rain and the color green. That is why I live in the Pacific Northwest. What did this book teach me? I didn't know what I didn't know about rain but it seems it was a huge amount of information. I learned about the ancient peoples dependence on weather for their crops and drinking water. I learned about the first weather forecasters and Daniel Defoe's obsession with collecting rain water numbers. I learned about the first attempts at creating rain by blasting the skies because during the Civil War soldiers observed the rain after a battle. I read about rainmakers and how they conned people and cities and governments into paying them huge amounts of money for rain that the probabilities were on the conman's side. Ms. Barnett tells us of the literary role rain has in books, poems and movies. Charles Dickens wrote about the rain a lot because he lived during the Little Ice Age where it rained an enormous amount. Mary Shelley's Frankenstein was written in the year with no summer. Author's state that the rain helps them write because nice weather is too distracting. I learned about the political consequences of rain legislation and the results if no action is taken to halt the climates change. This book is well researched and their are numerous pages of notes in the back. Most of all I remembered why I love rain so much and why we on Earth need it so as to not become Venus in the future. It's one of the magical books I've encountered since a long time. Romance upon Rain. An Enriching work by the author. Cruising the Americas, Western Europe and Indian subcontinent more often, it Covers cultural history of various civilizations BCEs and their rituals, history of rain articles and weather forecasting, geography and little science of planetary rainfall and speculations on climate change, flood warnings with the upcoming frontiers. "What's for dinner?" - Wilderness. I love the subject and I hate to abandon this book but I cannot abide the author's style. Everything is an overwrought metaphor, a lame cultural reference, or an outright cliché. Furthermore, there is no apparent organization of the material. One idea follows another in "Oh -- here's another interesting thing!" fashion. I gave the book its eighth chance and am finally bailing after a mere 35 pages in the middle of a sentence that begins "Think Indiana Jones"
Talk about broad! Talk about abstract and literal at once! The subject is "rain" and the slant (if you can call it that) is its "natural and cultural history." With such a huge topic, Cynthia Barnett has her work cut out for her and, overall, she pulls it off with aplomb. Yes, this could have been an encyclopedic-style book, but Barnett has a way with words and instead steers toward story. Well, stories. Multiple. The problem with such Herculean tasks as this is deciding what to write about. Rain Talk about broad! Talk about abstract and literal at once! The subject is "rain" and the slant (if you can call it that) is its "natural and cultural history." With such a huge topic, Cynthia Barnett has her work cut out for her and, overall, she pulls it off with aplomb. Yes, this could have been an encyclopedic-style book, but Barnett has a way with words and instead steers toward story. Well, stories. Multiple. The problem with such Herculean tasks as this is deciding what to write about. Rain is one big (and leaking) tent. Where to begin? Where to go? It's like herding cats (and dogs, to coin an idiom mentioned in this book). Barnett starts, logically enough, with the earth's beginnings, with comparisons to both Mars and Venus, to water's role in these planets' evolutions. From there she moves to early civilizations, how they dealt with too much and too little rain. Reining in rain, no easy task, has been high on man's to-do list for centuries. Some civilizations (the ancient Assyrians, for one, and then the Romans and the Byzantines) were better at it than others. If there's a small negative to the book, it's the choices that the author is forced to make. What should she include? Leave out? Discuss at length? Mention briefly? With decisions like that, she's bound to please some readers and disappoint others. She dwells on "rainmakers," for one -- the quacks and charlatans who made money by fooling people into thinking they could call on the rain and bring it down for farmers and others -- at a price.. Some used ordnance (explosions in the sky = rain, as was believed by many a Civil War veteran, including Joshua Chamberlain of the 20th Maine). Others used chemical soups that would emit all matter of highly-visible gases floating to the heavens. But all depended on coincidence and "rainy seasons" to bail them out. To me, this got a little old fast, but Barnett covered more than one such character. Then, in the "Writers on the Storm" section, Barnett gets into writers, composers, artists, who all tapped into rain for their material. To me this was more fascinating, and I could have read another hundred pages on it, but Barnett moves on sooner rather than later. It was not surprising to learn, however, that "bad" weather induces higher artistic output -- that is, many famous writers got more work done when living in a rainy climate vs. a sunny one. Being cooped up? Yes, but the mood, too. Rain has its wiles and will not be denied. Among other topics touched on are scents of rain, how the U.S. is enamored with "rain scents" in many cleaning products while the Europeans (esp. Irish and English) prefer "sun-fresh" products, Thomas Jefferson (who foolishly built Monticello on a hill, far from the river and more easily-tapped water supplies), strange rains (frogs, eels, mud, etc., falling from the skies), and the high electrocution rates of church bell ringers before folks figured out that water plus high places during thunderstorms equaled shocking finishes. The writing flowed easily and blended from one topic to the next with great ease. I think is the highest compliment to this author. Her fascination of rain blew my mind. I love rain. I love rainy weather. I love listening to rain. I love reading books near an open window on a rainy day. But this was nothing to how fascinated people are with rain. Barnett Not a bad book. Barnett covers cultural significance to discoveries made in hydrology. I learned some nifty things. For ex, did you know that the Nimbus 2000 from HP; the word nimbus comes from the Latin word for cloud!? Another interesting thing, the actual inventor of the windshield wiper was Mary Anderson NOT Henry Ford. In fact, Mary started the idea and even set out to patent it but it expired before she could get it done. Then another women named Charlotte Bridgwood who was the president of the Bridgwood Manufacturing Company came up with the same idea but her patent also expired. Finally, comes Henry Ford who took her idea and never acknowledged her nor Mary Anderson. Overall, it's an interesting book on how rain affects us so much and how climate change spells disaster for us. In learning, you don’t usually find what you want; it is much better to want what you find. Take the story of mauve: the color was created while looking for an artificial malaria drug. It was the first wholly created color dye and ushered in a new age of synthetic fashion. The inventor ran with it, sinking his entire family’s fortune into a mauve-dying factory, and made a mint. Mauve didn’t fight malaria though, so if William Perkin—the creator—wasn’t adaptable it might have landed in the scraph In learning, you don’t usually find what you want; it is much better to want what you find. Take the story of mauve: the color was created while looking for an artificial malaria drug. It was the first wholly created color dye and ushered in a new age of synthetic fashion. The inventor ran with it, sinking his entire family’s fortune into a mauve-dying factory, and made a mint. Mauve didn’t fight malaria though, so if William Perkin—the creator—wasn’t adaptable it might have landed in the scrapheap of history. The science-hostile skeptics of human-caused climate change point to past swings in climate as proof that today’s warming is part of a natural cycle. Every major scientific society and 97 percent of the world’s climate scientists say otherwise in their consensus that human greenhouse gas emissions are to blame for the current warming. The culture-killing drought of 4,000 years ago has been linked to a centuries-long failure of the Asian monsoon. Causes of other extreme climate events are better understood, such as the volcanic eruptions that marked the Little Ice Age. In contrast, the warming of the past century is not natural in origin; humans have become a dominant force. To be sure, prior to modern industry and the emissions associated with it, people in the distant past suffered devastating climatic shift. Given what we’ve learned about the lost cultures and the tragic times, it hardly seems advisable to plunge headlong into repeating them. The U.S. military made its first large-scale attempt to unleash rain as a weapon during the Vietnam War. Beginning with trials in 1966, and continuing every rainy season until July 1972, “Project Popeye” dropped nearly fifty thousand loads of silver iodide or lead iodide in the clouds over Vietnam, Laos, and Cambodia to induce heavy rains. The idea was to flood out roads, cause landslides, and make transportation as difficult as possible well beyond monsoon season—essentially, to keep the Ho Chi Minh Trail a muddy mess and foil North Vietnam’s ability to move supplies and personnel. ..The House and Senate ultimately adopted anti-weather-warfare resolutions. In 1977, the United States, the Soviet Union, and other nations ratified a UN treaty prohibiting military “or any other hostile use” of environmental-modification techniques. I will admit, I did not see that coming. As a reader, you’re in for many, many more exciting tidbits and, as my dad would say, fascinating bon mots—and he has said, because he also picked up Rain independently from, and prior to, my reading. Don’t blind yourself to only finding artificial quinine; instead, let the wonderful storytelling sell you something new and different—maybe in mauve? Reading Rain takes one on a tour across a gamut of emotions and experiences that cultures and people across the world have felt while experiencing this amazing phenomenon. This is the first book I've listened to that was written by Cynthia Barnett, and she did an admirable job of describing rain, something, even as somebody who revels in it, I find a little hard to do. The fact that South India is facing an unseasonal spell of showers right now when I'm listening to this book might have helped th Reading Rain takes one on a tour across a gamut of emotions and experiences that cultures and people across the world have felt while experiencing this amazing phenomenon. This is the first book I've listened to that was written by Cynthia Barnett, and she did an admirable job of describing rain, something, even as somebody who revels in it, I find a little hard to do. The fact that South India is facing an unseasonal spell of showers right now when I'm listening to this book might have helped the fact that I enjoyed it. Barnett takes you through time, from ancient Iraq's storm gods, to of course, Hindu mythology's millennia old connection to India's lifeblood: the monsoon. There are many chapters devoted to early modern English weather-watchers (including one Capt. Fitzroy, Darwin's expedition leader on the Beagle who founded the English Met), Seattle and Manchester's weird reputation as very rainy cities, and even how, an unseasonal rain spell led to Mary Shelley penning Frankenstein. America's weird war on the clouds in the late 19th Century (they literally fired mortars, and exploded dynamite in the hope that it might rain in the mid-west) is some of the most unintentionally funny writing I've ever read. These chapters of course go on to show that Earth's climate is a massively complicated system, one that we are changing, and still not yet knowledgeable to understand how we are changing it. Denial and anti-science, especially from politicians and other people in power is not the strategy to be adopted, as the history in this book shows. The book was thematically well organised: covering topics such as mythology, literature and films, meteorology, climate change, and quirky travel writing. I liked it, but I can see this might at the same time seem like a book trying to bite off too much. Also, for a book that was talking about a global history of rain, there was a disproportionate representation of history and writing from the US and UK (probably because, hey Barnett is American and speaks English) but also quite a bit of India. I definitely will not complain about this last bit, Barnett even travelled to Chirapunji --the rainiest place in the world-- in North-East India, easily a section I enjoyed the most reading about. But there is hardly any Africa, or rainforests anywhere in the tropics; actually apart from the US, UK, ad India, there is hardly anything about rain anywhere else in the world, sections that I think would have only enlivened this book. So, apart from minor quibbles, this is a perfect book to read (or listen to like I did to an audiobook) on rainy evenings. Its perfect mix of writing and empathy will only make you want to make you go out experience that wonderful phenomena called rain. So when I saw this book I thought it looked like a great pick up. Unfortunately, not so much. The author takes us through a little bit of the science of how rain occurs. Then the rest of the book is what role rain plays in history, rather than the "natural and cultural history" of rain. From how the Romans collected rain to the attempts of a Union soldier trying to settle a farm post-Civil War to how weather forecasting developed over time, etc. rain obviously plays a very important roles in history, but this book isn't actually about the rain. I must agree with other negative reviews that say the text is trying too hard to be poetic. There are some really interesting stories, topics and anecdotes here, but I couldn't help but feel the author tried much too hard to make it flowery and lyrical. It seems like it's trying to be far too much all at once: a little science, a little cultural impact (music and literature), its role in weather forecasting, how we capture water for farming and other needs, etc. I wish it had stuck with ONE topic and stuck with it. As it is, I found it hard to stay interested as the author would soon go off on another tangent about another topic and then come back, or stay with one subject for an entire chapter. 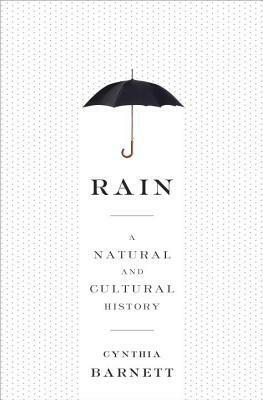 Rain: A Natural and Cultural History is a great piece of research about the past, present, and future of the relationship between humans and this unpredictable part of the weather sphere. Barnett introduces the known scientific facts and popular (and sometimes unpopular) opinions about the notorious precipitation stretching from millions of years ago to the near future. A good blend of the personal and cultural with scientific and historical gives the book a well rounded feel; there is something Rain: A Natural and Cultural History is a great piece of research about the past, present, and future of the relationship between humans and this unpredictable part of the weather sphere. Barnett introduces the known scientific facts and popular (and sometimes unpopular) opinions about the notorious precipitation stretching from millions of years ago to the near future. A good blend of the personal and cultural with scientific and historical gives the book a well rounded feel; there is something for everyone in these pages. I especially enjoyed the chapters about rain prediction and weather forecasting and the Scent of Rain chapter (due to my personal interest in perfume). The chapter about rain in literature was also highly interesting, and I am now able to understand my urge to write more as the winter sets in! Recommended for those who like perfume, history of quackery, Captain Fitzroy, and history of religion. “Into each life some rain must fall; Some days must be dark and dreary.” So wrote Henry Wadsworth Longfellow way back in the 1800’s, who, I just learned, hailed from my mom’s home state of Maine. Indeed, as this book reminds, the history of our planet is linked inextricably to rain and by reading it, you will be much better informed about precipitation, which both giveth life and taketh it away. It also reminds us that we used to be much, much more vulnerable to the weather, in whatever form it “Into each life some rain must fall; Some days must be dark and dreary.” So wrote Henry Wadsworth Longfellow way back in the 1800’s, who, I just learned, hailed from my mom’s home state of Maine. Indeed, as this book reminds, the history of our planet is linked inextricably to rain and by reading it, you will be much better informed about precipitation, which both giveth life and taketh it away. It also reminds us that we used to be much, much more vulnerable to the weather, in whatever form it took, and even though we give it a great deal of lip service today, we are much, much more impervious, Goretex and all. An extensively wet period of geological time is called a pluvial, and in case you’re cursing your own rainy afternoon, it might give you pause to remember that our planet has seen times when rain has fallen for hundreds or even thousands of years on end. Reading Your Inner Fish last had me examining my fingers and hands with wonder and, likewise, this book had me soaking in a tub and doing the same thing. Why? So I could check out the wrinkles on my fingers. Consider this backstory: before we split from primates, our ancestors lived some 10 million years ago during pluvial times in the rain forests of East Africa. Fast forward to 2008 when neurobiologist Mark Changizi found a surgical paper from the 1930’s documenting that patients with arm nerve damage don’t get any wet wrinkles on their fingers. You’ve probably never paid them much mind, but contrary to popular belief, these finger furrows are not simply a side effect of water, they’re the work of the autonomic nervous system. Other primates get them too and, yes, they’re an adaptation to rain. Like tire treads, these are rain treads! Cool, eh? They helped us to literally hang in there when the weather was wet and we lived in trees and spent a lot more of our days outdoors, as in all of it. Even cooler is that, when magnified, our finger wrinkles look like the drainage channels you’ve seen from aerial views of river basins and the like. Or at the beach when the tide recedes. The furrows flow downward, draining the water from our grip. They’re pliable and if you push on them, water should emerge. And they’re found nowhere else on our bodies. Pretty cool stuff in a book that’s filled to overflowing with all kinds of thought-provoking things. Like Cloud Nine. 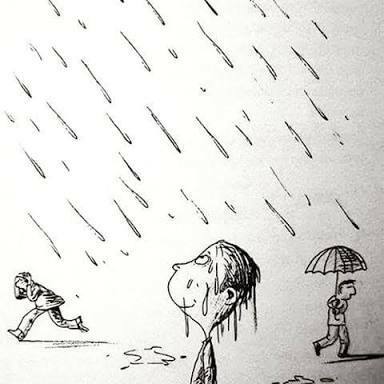 Everyone knows the phrase used to describe how great you’re feeling on, say, a day when there’s no rain. But here’s the origin. In 1896, the world’s top meteorologists gathered in Paris for the “year of the cloud”, which sounds suspiciously like a trumped-up excuse to visit the City of Light. There, in addition to dining on delicious food accompanied by expertly paired wine, they managed to agree upon a numbered system of ten cloud types. Called the International Cloud Atlas (remember that book? and movie? ), it’s still the official guide for identifying clouds. As every fourth grader learns, the King of clouds is the towering cumulonimbus and just hazard a guess as to which number it is in the atlas? Yes, it’s cloud number nine. In the second edition of the atlas, however, they shifted the mighty cumulonimbus to number ten. The book doesn’t say if that cloudy decision also happened in Paris, but I suspect it wasn’t a sober one. Still, the expression remains. Only a select few would get it if you said you felt like you were on Cloud Ten but I might just give it a go. Fun fact: wind is measured from which direction it blows; ocean currents towards which direction they flow. I made that mnemonic up but you can use it. The author recounts artist after artist who was, indeed, shaped by the weather. This includes a lovely story about Isak Dinesen from Out of Africa when she was harvesting maize with her young Swahili laborers, a tedious task, and began rhyming words to pass the time. After this, the boys would ask of her, “Speak again. Speak like rain.” It is thought that one of my own favorite poets, Emily Dickinson, suffered here in New England from SAD, which I’m sure you know is Seasonal Affective Disorder. She cranked out more poems in spring and summer but her best work came from fall and winter. Dark days, indeed, can provide poetic inspiration. Mary Shelley wrote Frankenstein during the last Little Ice Age in a stretch of freezing rain that was the summer of 1816 in Geneva. On a much smaller magnitude of scale, I, myself, finally relented and joined Facebook during the summer of 2009 in the woods of Maine when every day brought rain and more rain. It’s always fun to be reading a book and come across a friend or acquaintance which happened for me on page 203 when the author mentions Jennie Shortridge, who says it took her seven years to write her first novel in relatively rain free Denver, after which she moved to gray Seattle and wrote the next novel in a mere 15 months and now writes a book every two years, saying, “The dark and chill keeps me at my desk.” Indeed, I might agree, sitting here typing in my basement on a rainy day. And if you’re still with me, here’s my final fun topic—Frogs. No book about rain that’s worth its salt can successfully conclude without mentioning these rain-loving critters. In the chapter entitled “Strange Rains”, the author sanguinely reminds us that frogs are the very symbol of rain for many Native American tribes who, like many cultures, believe that frogs call the rain. Frogs are considered to be bioindicators, meaning their well-being reflects that of the environment, and because they require both land and aquatic habitat (amphibians, right?) plus have permeable skin that easily absorbs toxins, frogs are faithful signals of ecological havoc. A man named Charles Fort, for whom the Fortean Society of the supernatural is named, said, “You can judge a society by the health of its frogs.” Indeed, frogs have survived for past 250 million years but today they are disappearing from rain puddles everywhere. Nearly 200 frog species have vanished since 1980 and more than a third of all surviving amphibians are now threatened with extinction as part of a larger catastrophe that scientists are calling the world’s sixth mass extinction. Which is happening right outside your door, folks. Our froggy little rain-loving bioindicators are definitely trying to tell us something, one way or another. As John Fogerty wrote and sang after watching everyone dance naked in the rain at Woodstock, “and I wonder, still I wonder, who’ll stop the rain?” Like him, I, too, wonder, and I wanna know, “Have you ever seen the rain?” Even if you think you have, Rain will have you looking at it in a whole new light. Incredibly well-written non-fiction on weather and man’s influence (knowingly or unknowingly). I didn’t realise it took me almost exactly a year to read this book from first beginning it, but I was more actively reading it in the last few months. I tried my hardest to complete the majority of the book during the rainiest days in Sydney: suitably atmospheric for the content. An absolutely fascinating book about rain. Extremely well researched and diverse subject matter. The book explores ancient droughts, the history of rain through the study of tree rings, the smells of rain, the creation of Mackintosh waterproof fabrics by Charles Macintosh in 1822 and Bill and Robert Gore developing Gore-Tex in 1976 , the development of the umbrella and the oldest brolly shop in London dating back to 1830, the development of the windshield wipers in 1916 by two American women Mar An absolutely fascinating book about rain. Extremely well researched and diverse subject matter. The book explores ancient droughts, the history of rain through the study of tree rings, the smells of rain, the creation of Mackintosh waterproof fabrics by Charles Macintosh in 1822 and Bill and Robert Gore developing Gore-Tex in 1976 , the development of the umbrella and the oldest brolly shop in London dating back to 1830, the development of the windshield wipers in 1916 by two American women Mary Anderson and Charlotte Bridgewood both whose patents expired before adoption by the automotive industry, the phenomenon of skies raining frogs, snakes, spiders, the creation of the weather channel in 1982 by John Coleman, the 1896 nine categorizations of clouds with the highest cumulonimbus "being on cloud nine," the Indus Valley Harappan people an India/Pakistan civilization lost 5,000 years ago due to prolonged drought for two centuries, the settling of the American plains and the destruction of the grasslands, our paving over America which decreases aquifer collection and increases pollution runoff, the science and study of seeding clouds to produce rains and attempts to control wars such as the Vietnam War, the building of homes with thatched roofs versus other materials and Frank Lloyd Wright purposefully designing buildings to bring rain into a structure, the influence of rain in writing from Emily Dickinson, Charles Dickens, Ernest Hemingway, Mary Shelley, Walter Raymond, Toni Morrison to filmmaking such as 'Singing In The Rain' to the composition of music by the Doors' 'Rider on the Storm,' Jimi Hendrix's 'Rainy Day, Dream Away,' Frederic Chopin's 'Raindrop Prelude,' and Morrissey's moody indie pop group the Smiths, capturing the essence of rain in Kannauji, India by the ancient process of 'mitti attar' when in May and June petrichor has built up before the monsoons, the damaging affects of acid rain and the other pollutants dispersed through rain. This is a timely book considering the extreme drought California and other western states are facing. Storms continue to become more severe. Fossil fuels, fracking, deforestation, population growth are impacting our earth. Sweet water will be a luxury in the not too distant future. This book is a must read for everyone. "Climate change frightens and divides us, to such an extent that many people simply refuse to talk about it. But everyone loves to talk about the rain. Too much and not enough, rain is a conversation we share. It is an opening to connect-in ways as profound as prayer and art, practical as economics, or casual as an exchange between strangers on a stormy day." "Amid the mysterious workings of Earth and it's atmosphere, one things is clear-when we change one part of the rain cycles we change another somewhere else." "If Fort is right that society shall be judged by the health of its frogs, we're in for a harsh adjudication. Frogs have survived in more or less their current form for the past 250 million years-they made it through the mega-droughts and the plivials, the ice ages and asteroids. Today they are vanishing; perhaps this is why frog rains have become so rare in modern times. Nearly two hundred frog species have vanished since 1980 and more than a third of all surviving amphibians are now threatened with extinction, part of a larger catastrophe that scientists call the world's sixth mass extinction." "While rain is one of the trickier parts of the atmosphere to measure and to understand, changing rainfall patterns are among the earliest and most obvious tremors of a warming globe." Who would have thought that a nonfiction book about rain could manage to maintain my interest throughout its almost-300 pages? This one certainly did, but then it is about much more than “just” rain. It began with a lovely quote from Ray Bradbury, but the author's own words were quite wonderful too. It is obvious that she developed a great love and respect for the subject, that it became close to her heart. The story covers rain and its relatives over the history of time, how it has and does affec Who would have thought that a nonfiction book about rain could manage to maintain my interest throughout its almost-300 pages? This one certainly did, but then it is about much more than “just” rain. The story covers rain and its relatives over the history of time, how it has and does affect us physically, culturally, politically. It explains in a very clear way why what we used to call global warming but now more commonly call climate change can make the wet areas wetter and the dry areas drier, the cold colder and the hot hotter. The prognosis is not good. The prognosis is frightening. “In recent years, Congress has resembled the rainmaking 1890s more than the emissions-lowering 1990s – ears open to the influential uninformed rather than its own scientists. U.S. Senator John Inhofe of Oklahoma, perhaps the most prominent national opponent of meaningful legislation to reduce fossil-fuel emissions, has said that humans cannot possibly control the climate because only God can do that.” I am not as kind as the author – these people are not uninformed, they just choose to not believe the evidence they are given. Still, this book is about rain, too much, too little, and its affects. Its about culture around the world shaped by rain. It is not foremost a political book. It's about witchcraft and rainmakers, evolution and plagues. For a book about rain, it has an amazingly wide and interesting scope. This book caused me to Google several of the things the author mentioned. If you have never heard of the Double Decker Tree Bridge, it is well worth searching for images. While I wanted to learn more about the subject of rain and weather, I was afraid this book would be dry, no pun intended. It was not. It was fascinating but more frightening than a Stephen King novel. Writing from sunny Seattle, where we're supposed to be in the depths of June gloom but are instead in a sunshine filled drought. Southern Californians don't think much of our drought, claiming theirs in dryer and much, much worse, but those of us in the NW have always known that SoCal is its own canto of the Inferno. Seattle is not the wettest city in the US, that would be New Orleans, and Seattle doesn't even make the top 15. We do rank sixth in most rainy day Writing from sunny Seattle, where we're supposed to be in the depths of June gloom but are instead in a sunshine filled drought. Southern Californians don't think much of our drought, claiming theirs in dryer and much, much worse, but those of us in the NW have always known that SoCal is its own canto of the Inferno. Seattle is not the wettest city in the US, that would be New Orleans, and Seattle doesn't even make the top 15. We do rank sixth in most rainy days, just 18 days fewer than Rochester, NY. However, we're number one in cloudy days, racking up 226 a year - or 62% of days. So, if you're thinking of moving here just think "Gloomy Sunday," a.k.a., "The Hungarian Suicide Song," and don't. I like popular science, (actually more the accompanying anecdotes than the science) and swoon over Diane Ackerman, and though "Rain..." isn't quite as florid, it does have its moments while providing lots of fascinating information about weather, climate, and rain. For instance, did you know that after the earth was formed it rained for a thousand years? Or that there's a village in India that traffics in all things attar (or scent) related, where they claim to have distilled the odor or fresh rain? Or that it has indeed rained frogs, and that raining cats and dogs comes from a time of heavy, heavy rains that left the carcasses of strays in the gutters? And, yes, there is also science, but I'll leave that to you. Oh, here's a little Seattle humor, it's a weather report that speaks to the 14,000 foot mountain that dominates our skyline: When you can't see Mt. Rainier, it's raining; when you can see Mt. Rainier, it's going to rain. This ranks among the group of particularly successful popular science/history books I've read. It is ordered well, and gifted at covering topics in enough depth to get you interested (vs too little information or too much given to one event/issue) and yet still feel like a full picture. The writing is good, with bits of humor which come across as natural rather than forced. The book is divided into five sections, which cover different aspects of rain and our relationship with it, with a very good This ranks among the group of particularly successful popular science/history books I've read. It is ordered well, and gifted at covering topics in enough depth to get you interested (vs too little information or too much given to one event/issue) and yet still feel like a full picture. The writing is good, with bits of humor which come across as natural rather than forced. The book is divided into five sections, which cover different aspects of rain and our relationship with it, with a very good introduction about the origins of rain (why we have it and Mars and Venus lost it, the transformation of earth, etc...). One section deals with the early weather recorders and studiers and the invention and marketing of rain gear. Another covers American Rain with chapters on Thomas Jefferson (and the poor placement of Monticello when it came to water access), the insane belief that 'rain follows the plow' by which the great plains were settled (a region formerly called the Great American Desert before a brief wet period), and the rainmakers that showed up during droughts (including those who tried to practice actual science, not just the outright charlatans). I really enjoyed reading it, learned a lot of new information and made notes on books covering some topics in more depth (a home run for me and any similarly broad non-fiction work). My favorite factoid being about the origin of the "Neither rain nor sleet nor dark of night..." phrase coming from Herodotus's descriptions of Persian couriers (favorite partly because my mom was a mail carrier for most of my life). What an enchanting book! I expected Rain would be well written, but I didn't realize it would be so fascinating. Although it reminded me some of Bill Bryson's A Short History of Nearly Everything, Rain is a much better book. For me, good nonfiction needs to have a strong, well-developed character (or more than one) that I can care about and an arc of a story. Here the main character is clearly rain in its presence and absence and many permutations from drizzles to monsoons. There's a whole chapt What an enchanting book! I expected Rain would be well written, but I didn't realize it would be so fascinating. Although it reminded me some of Bill Bryson's A Short History of Nearly Everything, Rain is a much better book. For me, good nonfiction needs to have a strong, well-developed character (or more than one) that I can care about and an arc of a story. Here the main character is clearly rain in its presence and absence and many permutations from drizzles to monsoons. There's a whole chapter about the scent of rain and one on strange rains (frogs and various colored rains). The story is the history of the interaction between rain and the Earth and its human inhabitants. There are adaptations to rain (raincoats, umbrellas, windshield wipers) and there are many, many misguided attempts to control rain, from prayers and human sacrifices to dams and drainage canals. It's particularly interesting in our age of climate denial to read about the things people once believed about rain and the things they did as a result. In Europe particularly, thousands of women were tortured and killed as witches responsible for storms. Here in the US, we believed "rain follows the plow" and sent settlers to their ruin trying to turn the plains into farmland. We also foolishly paid rainmakers to set off cannons and perform magic to bring on rain. I love that it's such a big picture book, but that Cynthia Barnett weaves in many fascinating stories of individual players in the drama of rain through the ages. And there's some great stuff about rain as creative inspiration for writers, musicians and movie makers. I love rain. I really do. Although I have fleeting moments during our Seattle summers where the Vitamin D tries to worm its way into my blood stream, by and large, I would be one happy lady if I could live only in the drizzly, gray moments of our fall and winter. It's no wonder that when I saw this book, I knew I had to read it. In Rain Cynthia Barnett explores everything from the religious manifestations, cultural implications and historical stories of rain across the globe. It would have been s I love rain. I really do. Although I have fleeting moments during our Seattle summers where the Vitamin D tries to worm its way into my blood stream, by and large, I would be one happy lady if I could live only in the drizzly, gray moments of our fall and winter. It's no wonder that when I saw this book, I knew I had to read it. In Rain Cynthia Barnett explores everything from the religious manifestations, cultural implications and historical stories of rain across the globe. It would have been so easy for Barnett to have written a dry spiel, spouting facts and ladeeda blahblahs (technical term) but instead she deftly crafts story-like narrative that is engaging and informative. What I think is the real testament to the book is the fact that I actually remember a lot of the facts I read - most startling among them, that our witch trials pale in comparison to the trials in Europe. Overall I think this is one of those great non-fiction books that not only makes you feel smarter but actually makes you smarter in a sneaky, lovely, story-telling way. Barnett's writing is clean, clear and informative and yet lively. She does a fabulous job of tying over-arching ideas across chapters and tying rain to both day-to-day life as well as the larger historical picture. Definitely a great ready for anyone who loves the gloom, doom and a little drizzle. from the whitman quote from "the voice of the rain" through the first few pages about rain on mars from ray bradbury, i'm hooked----living in the high chihuahuan desert makes the appreciation of every drop of rain a joy...........hope the rest of the book is as good as the first few pages!!!!! 7/7-----finished....when i read non-iction i hope to learn something new or be challenged. this book worked on both counts. i'd strongly recommend it---well-written, well=researched, lots of information, an from the whitman quote from "the voice of the rain" through the first few pages about rain on mars from ray bradbury, i'm hooked----living in the high chihuahuan desert makes the appreciation of every drop of rain a joy...........hope the rest of the book is as good as the first few pages!!!!! Cynthia Barnett is the author of "Rain: A Natural and Cultural History," longlisted for the 2015 National Book Award. Her previous books are "Mirage: Florida and the Vanishing Water of the Eastern U.S." named by The Tampa Bay Times as one of the top 10 books that every Floridian should read, and "Blue Revolution: Unmaking America's Water Crisis" a Boston Globe top 10 science book of 2011. The Globe Cynthia Barnett is the author of "Rain: A Natural and Cultural History," longlisted for the 2015 National Book Award. Her previous books are "Mirage: Florida and the Vanishing Water of the Eastern U.S." named by The Tampa Bay Times as one of the top 10 books that every Floridian should read, and "Blue Revolution: Unmaking America's Water Crisis" a Boston Globe top 10 science book of 2011.